Want to have your amateur review of Red Dead Redemption sponsored by a major retailer? Better start making nice with Kmart. 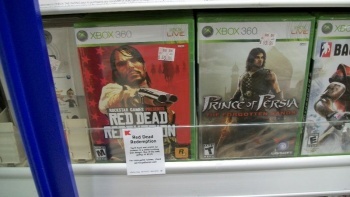 The next time you visit Kmart, if you find yourself in the videogame aisles (and let's be honest here, people like us always gravitate to the videogame section in large stores), you might see the following blurb hanging in front of Red Dead Redemption: "'You'll hunt and search for treasure in a world teeming with danger. One of the best games of 2010." Not inaccurate, sure, but who wrote it? Has Kmart partnered with one of the major reviewing sites on the internet? Does it have employees whose job is to play and review games? Nah - it's just taking review submissions from its community. In a post on the Kmart blog, it was announced that the retailer would be posting excerpts from game critiques written by members of itsMyKmart community program. The blog's guidelines suggest that reviews should be well-written, informative, and "[written] for an audience that may be made up of non-gamers." In other words, don't start complaining about how Super Street Fighter IV "totally broke [your] wake-up game." Kmart may be posting community reviews, but sorry, it won't be sending free games out for review - you'll have to buy those yourselves. That's a real shame, huh? I mean sure, it'd be horrible business practice, but "Kmart sends free games to anyone who wants to write a review" would be one hell of a publicity move.